As more pressure mounts to raise the federal minimum wage to a $15 living wage, Amazon announced on Oct. 2 that its lowest paid workers will make $15 per hour. 250,000 full-time employees and 100,000 seasonal employees will receive this pay hike that goes into effect Nov. 1. This comes at a time when Amazon founder and CEO Jeff Bezos has replaced Bill Gates on top of the Forbes list of the world’s wealthiest. Meanwhile, Amazon subsidiary Whole Foods has workers eager to organize unions against what they see as draconian workplace policies. The company even includes a management training component that discourages worker organizing. Amazon’s much scrutinized workplace practices leave people scratching their heads about its influence and long-term goals. On one hand, the embrace of the Fight for $15 goal is lauded. But the company remains embroiled in work condition controversies like high-pressure work cultures for its white-collar employees and surveillance-style tracking of its warehouse workers. In 2015, The New York Times ran an investigative article about Amazon’s stressful white-collar workplace conditions. The article spurred quite a conversation about workplace cultures. But that’s white-collar opportunities in the company; warehouse workers are another story. Warehouse employees’ hands and locations can now be tracked using state of the art motion technology patented by Amazon itself. Packing timers, timed toilet breaks and 55-hour or greater work weeks have also been reported. Over at Whole Foods, there is already pushback against encroaching management practices. A new order-to-shelf (OTS) system seeks to streamline worker behavior by detailing a specific "set of procedures for employees to follow that uses scorecards to prescribe specific ways to store, display, purchase items on store shelves and in stock rooms." Some employees complain that the OTS system seeks to make them into robots performing rote tasks. Since Amazon’s takeover of Whole Foods, employees complain they have had to perform duties outside of their training range, and labor budgets remain generally low. Amazon does acknowledge the long-term goal of eliminating certain job classifications, such as payroll benefit specialists and in-store graphic designers, while expecting other employees to take on these tasks without extra compensation. Whole Foods has already gone up against the National Labor Relations Board (NLRB) and lost due to its union-busting tactics. Now, employees fear that they will continue to compromise work conditions as Amazon’s penchant for automation and homogenization now runs the show. Already, there’s an analysis circulating that as Amazon rolls out a new minimum wage, it will actually harm some workers’ overall pay as monthly bonuses and stock awards are eliminated along with the move to $15 hourly. In the U.K., it’s reported that thousands of Amazon workers could lose £1,500 in a single year due to the "removal of employee share and incentive schemes." Amazon defends the move, claiming that the wage increase guarantees "more immediate and predictable" cash. It is difficult to meet news of a wage increase without skepticism, as Amazon accrues a massive fortune. Keep in mind that Amazon has grown in leaps and bounds since its early arrival as an online book retailer, and it is not done growing yet. 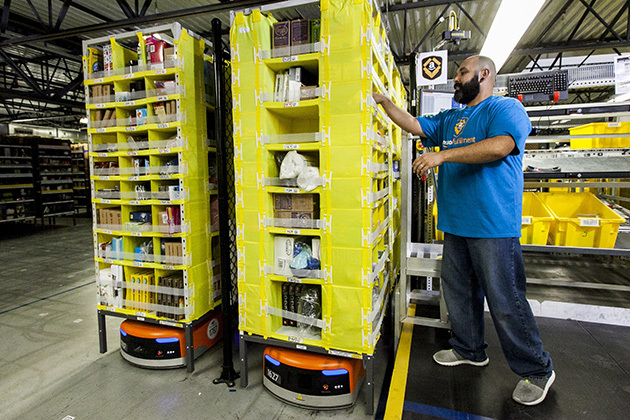 Now it’s gearing up for a high-tech future, even working on "fulfillment center robots and delivery drones" to improve its customer service focus. On paper, the pay raise looks like a smart move for such a massively influential employer. How the raise plays out next to lost stock awards and monthly bonuses, and general workplace conditions, has yet to be seen.